A fascinating use of room-scale VR, Eye of the Temple puts you in the shoes of an explorer, dodging and weaving around a massive, mysterious, heavily trapped ancient temple. Eye of the Temple, from Sanctum Dreams, uses extremely clever movement tricks to maximise the 2 x 2 metre space it requires to run. It does this by having players step between moving platforms, steadily backstep on rolling stones and side-step to avoid dangerous traps. Each of its challenge areas is designed in a way that moves you around a 3 x 3 division of the available floor space — it does this so cleverly that you are often surprised you’re still within the boundaries. I was lucky enough to play Eye of the Temple while at the Nordic Game Conference earlier in the year. It was one of my first VR experiences and I was extremely conscious of the game containing a lot of automated movement — something that can cause people to lose balance quite easily. There are certain things in place to counter potential loss of balance. For a start, there are pots and gems littered around the game world, which give you something to focus on as you are moving. While this may not have been designed to solve the movement-balance issue, the distraction that they (and the cascading waterfalls or looming traps) provide gives you something to focus on over the moving world. The temple you explore is vast, initially starting in a flooded water garden before heading into a deep, dark (and heavily trapped) series of chambers. Scarabs, levers and the previously mentioned vases litter the temple, giving you things to crack your whip at. Your other hand holds a torch, which you can ignite from, or use to light up, parts of the environment. Eye of the Temple’s exterior starting area is a perfect introduction its movement systems; it quickly introduces you to using the whip to open up newer areas and gradually eases you into the traps that demand you use half of the tile space or duck to pass under rocks. It also introduces you to the game’s iconography: the eyes that activate new tiles and let you progress further and the symbol that indicates an active movement stone. In this puzzle you are relentlessly pursued by a block which can kill you. After you first enter the puzzle, you head outside into the open, the looming descent over the side of the temple edge serving as a reminder that you’re meant to be far away from civilization. However, most of your time is then spent navigating through near darkness to find the next outside area. Deadly flame traps pull back the darkness, alongside the flickering of wall torches, revealing other traps like swinging blades, spikes and lowering ceilings. I played around thirty minutes of Eye of the Temple and walked away very impressed. While moments like using the whip (and dying) certainly broke immersion, the setting was amazing and well realised. As with most other room-scale games, headset cables are somewhat an issue, but if you’ve already come to terms with this (or are looking to move to one of the wireless options) then you’ll agree with me: Eye of the Temple is looking to be a must-have VR game. 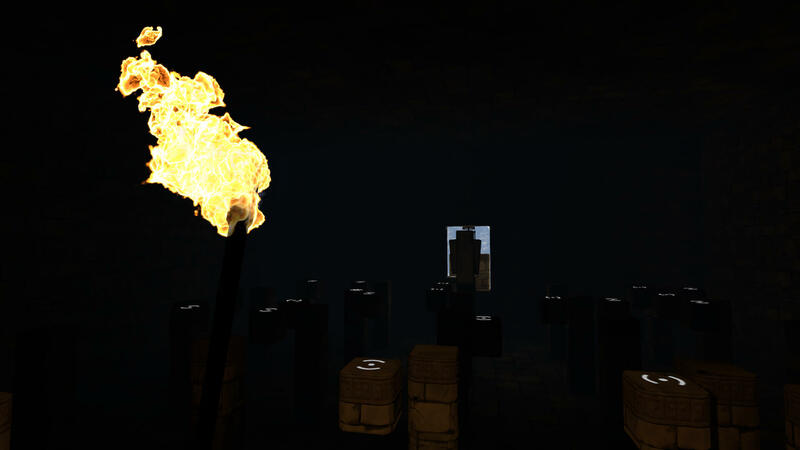 Eye of the Temple is currently in development for PC, with a provisional release plan for later this year. If you’re interested in following the game’s development, you can follow the game on its Twitter @eyeofthetemple. Been following the development of this for a while – really looking forward to it! I really felt as though I didn’t scrape the surface of the game during my thirty minutes. As a matter of fact, I only stopped playing because I was becoming increasingly conscious that I was dying a lot against the moving column enemy, otherwise they’d have had to drag me away.